Now that our holiday forum is live year-'round, let's share Hallowe'en recipes! As the Scot present right now, I feel duty bound to start this topic, since it was the Scots who "invented" Hallowe'en. Feel free to challenge me on that! This shrimp and grits recipe is more of a cold-weather comfort food than a scary food. It was fast and easy. Frozen shrimp is finally becoming affordable again. I paired it with a salad of arugula and cherry tomatoes from my garden and baby corn. The chives and lemon juice were also from my garden. The baby corn could be arranged in a hand configuration for more goulishness. Okay, this is another scary and Scottish dish. I had this in Scotland at, naturally, Scot's Restaurant, when Kelda and Collum took us there. Ha-Ni-Tatties: layers of nips (parsnips), tatties (potatoes) and haggis! Very appropriate for Brokies since Jack was peeling potatoes while Ennis warshed, 'snips because Ennis was castrating cows, and haggis, made with sheep's innards, like what the coyotes favored! Scary, huh? 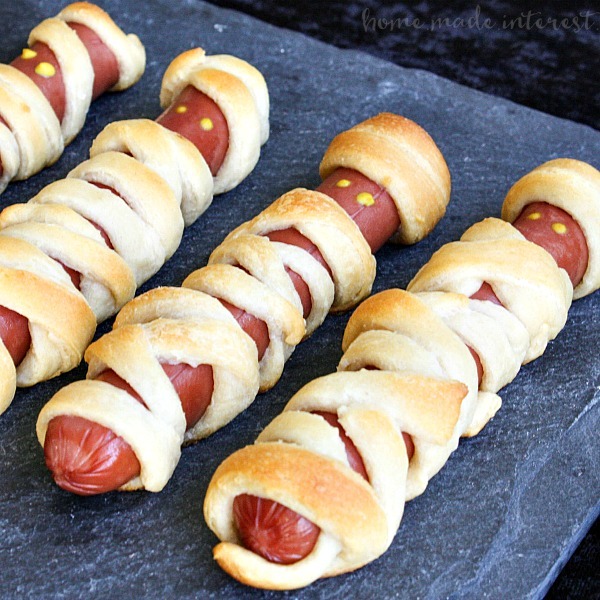 I went to a Halloween party, and made hot dog mummies. I didn't think they'd be that popular, but all 24 were eaten.